The marigold flower is a time honored tradition for many garden beds. It is a easy to grow plant in many soil conditions and climates. It will also thrive in containers such as window boxes or pots. It has been used for its ability to repel certain garden insects. Many of the species will grow quickly and become densely packed. They are ideal for growing easy to care for blooms all summer long. 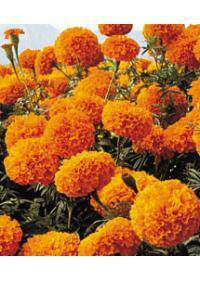 Marigolds, known as Tagetes Erecta, contain 56 species in the genus. It contains both annual and perennial plants that flower and seed. These are known as native to both North and South American areas. Tagetes Erecta are commonly called African or American marigolds. These produce yellow or orange blooms and can reach up to 5 inches. These are often chosen for bedding plants as they spread and blossom. Tagetes Patula, known as French Marigolds, have more color variation. Bicolored blooms are common, as are reds, yellows and orange colors. These are seen in window boxes and patio containers and gardens. Signet Marigolds, known as T. Signata Pumila, offer a unique look. Clusters of small yellow or orange single flowers are commonly found. These have a lemon fragrance that is very popular for flower beds. The marigold is a staple for many flower garden beds and containers. Most varieties have a pungent scent, while some smell pleasant. Some find the flower fragrance pleasant despite its pungent nature. These are grown in almost any kind of soil, from rich to rocky. Its easy to grow nature makes it ideal for any kind of home garden. Often it is necessary for growth that the soil can drain properly. Containers such as window boxes are often chosen for this plant. These are often placed around decks, windows or on front porches. They are also commonly found planted underneath trees and mailboxes. Shorter varieties may be planted along bed edges or rock placements. The taller species can be planted for taller coverage of an area. It can also be mass planted for better ground cover in damaged lawns. Marigolds are often used to create a variety of useful products. The oil is often retrieved to make essential oils for other goods. The most common use for the oil is an additive to many perfumes. Essential oil from Tagetes are also used as a flavoring for products. This essential oil is commonly found in both tobaccos and foods. It is also used as a food coloring when the flowers are harvested. When used as a food coloring, it can be found in many different items. Pasta, oil, mayonnaise and baked goods all utilize this coloring. The United States does not allow this coloring except in poultry feed. The flowers are also a nectar source for several butterfly species. It is also used as a plant food for some caterpillar species as well. This makes it a versatile addition for a colorful butterfly garden. They also make wonderful additions to arrangements, providing a unique flavor not normally found in traditional bouquets. Florists around Peoria, IL, Orange, CA, Everett, WA, Sunnyvale, CA, and Seattle, WA are able to sell these flowers. Marigolds are often used in the fall to make table arrangements. They offer a simple statement when paired with candles or vases. These are often given as a potted plant as opposed to a bouquet. These flowers are often used for a symbol of creativity and passion. Many think of them as a simple plant that is sturdy and hearty. For this reason it is often chosen to supplement other flowers. They are also used to repel insects when planted in garden beds. Several types of beetles and insects are repelled by the plant. This provides another reason to add marigold plants to the garden.